It’s been a while since I have written, partly due to time, but I know that when I really want to write, I find the time. I think the real reason is that something has been brewing, and I have been waiting for it to become clear. I’m not sure it has entirely, but I have felt a shift in myself and in the world, and it's time to write. And here I am at the same topic I was at before. In my previous post I said I believe a change of consciousness needs to take place in order for planetary healing to occur on the level that allows us to survive. I mentioned that according to Depth Psychologist, Carl Jung, it isn’t necessary for everyone to achieve the necessary level of consciousness. There only have to be enough awake individuals in order to transform the collective consciousness and prevent the global destruction of life on the planet. I sense that though things are looking pretty dark at the moment, healing is actually occurring, and I am anxious but hopeful about the state of affairs. Have you also been sensing a significant shift in recent weeks? Tensions have risen, yes, but this may be a necessary part of the process. It’s like a dam has broken and a force has been set loose. Or maybe it was the force that broke through the dam. In any case it feels powerful, and I have some things I wish to say about it. I believe this force, whether we imagine it as a river or flood or tempest or maybe even a fire, is a consciousness breaking through, and there is no holding it back. The Kavanaugh hearing (which probably wouldn’t have occurred if not for the ‘Me Too’ movement) and the United Nations report on climate change are recent events that are markers and have also helped unleash its ferocity. How they are linked is that the old guard, that is, the negative aspects of the patriarchal system, particularly the rigid systems that have oppressed women and the environment, are taking their last gasps. In speaking of patriarchy, I am not pointing a finger at men, not even at Brett Kavanaugh or Trump. By blaming them we are missing the point. (I am in no way excusing Kavanaugh and Trump) We have all participated in and supported the patriarchy. What is relevant is that a universal intelligence and energy, what is referred to as the feminine principle (also known as feminine consciousness, and divine feminine, etc.) is moving through us and the world with a vengeance, whether we are comfortable with it or not and we need to become conscious of it so we can work with it. It may be a while before its rage has subsided and it may also be a while before the patriarchy takes its final gasp, but this is the necessary healing medicine for our planet at this time. The feminine consciousness/intelligence/principle is not on a mission to destroy the masculine, which would only create more polarity and problems. Ancient wisdom tells us the two forces need to be united. The patriarchy has been in the way, though we might argue it was a necessary stage in the transformation of consciousness. Men and women (and those who identify as neither) now need to hold both feminine and masculine consciousness within themselves. I am aware that some people reject the idea of the feminine and masculine principles because they believe it supports a paradigm of duality. But we cannot attain a state of non-duality without becoming whole. (Etymologically, ‘to heal’ means ‘to become whole’) We need to embrace our rejected “shadow” sides before we can even grow close to wholeness and true non-dual consciousness. Women are representatives of the feminine principle but it is also part of men (and those who identify as neither). Men have been socialized to reject it in themselves, and to reject it in women, even if they have exploited it. Women have also been taught to disregard it and reject it in themselves and the world. As a result, we unthinkingly harm ourselves and each other and exploit nature as well because it, too, is representative of the feminine realm. Furthermore, with this half of life lost in shadow, we miss out on being deeply fulfilled and living our true potential on a personal and collective level. Before he died in 1961, Jung said that unless we embrace the feminine principle, we will not survive as a species. He had little hope that we would, but he thought there was a chance we might squeak through. He was adamant we would survive only if we woke up and honoured and integrated the feminine. While I support activism, I don’t believe it is enough to make the necessary changes at this point. Nor is recycling or taking the bus (though I do both anyway). We need to develop our feminine consciousness and ultimately bring it into relationship with masculine consciousness, but this is not as simple as it may sound. It does not come about by just making simple changes. It is a way of life and a transformational path. And as Jung noted, as we transform our own consciousness, we transform the collective consciousness. I hope to write about the many ways we can do this work. You may be well versed in all of this already, but in case you aren’t, as a start, I discuss below what is generally associated with the feminine principle/consciousness, though granted, different cultures may consider some items masculine. It really doesn’t matter. What matters is that we become whole. If you see any weaknesses within your own system in any of these areas you can start there. Openness, receptivity, vulnerability and listening are associated with the feminine. Surrender is also part and parcel with this consciousness. Already you can probably see why we are uncomfortable with it. But the feminine is not weak. In fact, it is inseparable from Nature (as a force). The challenge is to attune to (listen and be receptive to) this force so we can align ourselves with it. This is how we live our potential and is the real meaning of living our destiny. Also associated with the feminine are the heart, feelings, empathy, and intuition. The body and its sensations and messages are related to the feminine, as is relationship. This includes relationship with our selves, our bodies, the earth, the beings of the earth, others, and with the divine. Inner experience and the unconscious are feminine phenomena. Attuning to invisible realities and Wisdom are as well. Understanding symbols and perceiving layers of meaning (as opposed to literal thinking) are essential aspects of the feminine. Mystery is part of the realm of the feminine and honouring the Mystery without having to dissect it or even understand it is a way to pay our respects to it. Along with Mystery, the feminine is associated with the dark, that is, the night and the winter. Awareness of life in terms of cycles and spirals instead of in linear lines helps us align with the feminine. Death, transformation, and rebirth are all aspects of this principle. Being present and process oriented and allowing goals to present themselves rather than arbitrarily choosing them, are ways to align with the feminine. Descending into our depths and into our souls are essentially feminine paths. In fact, our souls, themselves, are generally associated with the feminine, whereas spirit is more associated with the masculine. 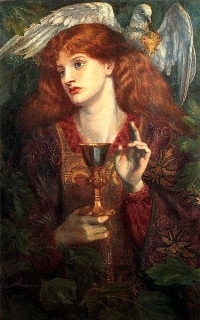 In mythological terms, in seeking the feminine, you are on the quest for the holy grail. And as the story tells us, when you find it, the masculine too (symbolized by the wounded king), will be healed, the waters will flow again, and the wasteland will be restored to its richness and abundance. Life on the planet will thrive.